Ever noticed how music puts you in the mood? When you’re feeling down, play some upbeat, happy music and you’ll see ♫ today is going to be a good day ♫. When Shabbos is coming, play some Shabbos music to get you into the spirit, and appreciate the “matana tova- beautiful gift” that Hashem has given us. Nothing makes me happier than to create music that inspires both myself and my listeners. I love to sing songs with meaning, songs that encourage us to be greater, songs that help us connect to Hashem. For those who don’t yet know me, I like to say that I didn’t choose music, music chose me. I feel that my shlichus, the reason Hashem put me in this world, is to encourage people through music. With my latest album, Lo Nafsik Lirkod, I hope to again inspire and encourage my listeners as they connect to the beautiful melodies and words. Yes, we have challenges, both individual and national. But together, let’s face up to those challenges and continue not to just be okay, but to dance through them. Things will turn around! I’m excited to share this album with you – and want you to be involved! Making this album has been an awesome endeavor, one that I’ve been working on for the last two-and-a-half years. All contributors to this campaign will receive an exclusive free download of an EP with 5 to 7 songs that are not featured on the album. The Am Echad album was almost finished, but it had a different name because there was no “Am Echad” on it. Then because of people like you, who contributed to the crowdfunding campaign for that album, I was able to produce it properly and create a video that has inspired over 5 million views to date!!! To me, music is a two-way conversation. I create music, you listen. I’d love to hear from you so we can keep this conversation going. Together we will create some lyric videos, where you hold up a word or phrase from the song, and I sing. 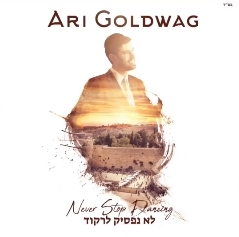 Yes, YOU can be featured in the next Ari Goldwag music video by contributing to this campaign. Love the idea of being featured in a hit Jewish music video? So let’s take this one step further. We will be shooting a video in Eretz Yisreal and one in the New York area Be”H. A few lucky contributors will participate in those videos – how cool is that?! So come on board, connect to the artist, musicians and all involved in this new album, who invested their heart to inspire yours!